Executives responsible for hiring and ramping new marketing and sales hires have a whole host of challenges in finding and hiring good candidates and in getting them productive. For new marketers it's usually a brief, sink or swim induction that starts with a content immersion and then the writing begins. Onboarding new sales hires is a longer process, commencing with indoctrination in the product; demo, presentation, pricing, followed by CRM and sales process training. After meetings with the sales manager to discuss territory and key accounts, the sales rep is off-and-running. Unfortunately for sales reps in many companies, from this point on, they are on their own. They have to source their own leads, figure out how their customers buy their product and through trial and error, how to sell the product. It should, this is pretty standard stuff in mainstream technology companies. For a straightforward product with a 1-month sales cycle time, it might take 3-4 months for a rep to become fully productive. For a complex enterprise solution with a 6-month sales cycle, it will likely take a year or more. Dave Kurlan’s formula for Ramp up time = the length of your sales cycle + the length of your learning curve + 30 days. Dave adds a couple of months to ramp time for either lack of industry knowledge or lack of sales experience. The only variable in Dave’s formula is the length of your learning curve. Bad hires, read the Bad Breath vs No Breath article. From the same CSO Insights 2014 Sales Performance Optimization Study, only 36.6% of companies are able to ramp salespeople to full productivity inside 6 months. 59.7% of respondents take 6 or more months to ramp salespeople to full productivity. In sales there is no hiding a slow start, but it takes several months before problems are visible. Sales reps complain of poor quality marketing leads. Despite making lots of calls (activity), forecasts and revenue are weak. Salespeople will try to sell lower cost, point-products to departmental users, instead of going for the enterprise platform sale, (except it takes 10 times as many deals to make up for an enterprise sale). A small handful of senior sales exec’s. are “knocking it out of the park”, but the rest of the team is struggling. New hires become frustrated at their lack of success and quit. Once a new rep has been hired, the only levers you have to increase the speed of ramping salespeople are through more effective transfer of selling knowledge, increasing the effectiveness of selling tools provided, and on-the-job coaching from sales managers. If you are a product-marketing manager or sales-enablement leader, what can you do to help new hires, and established salespeople to become more successful, faster? Weak and ineffective product-focused content is a primary cause of long sales ramp-times. Salespeople take many months to synthesize and translate the product messages in their own mind, into something that will actually connect with buyers. In 9 out of 10 meetings with buyers, B2B salespeople fail to contribute value, beyond product features and pricing, (Sirius Decisions). Buyers don’t need more product information from salespeople; they can get all that in a couple of mouse-clicks. Buyers need more insight from salespeople. They expect salespeople to have some knowledge of their business, their competitive environment and their likely challenges, in order to contribute value. 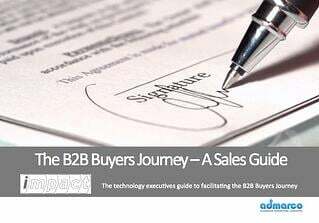 Plus buyers need to hear how others have succeeded in overcoming similar challenges. 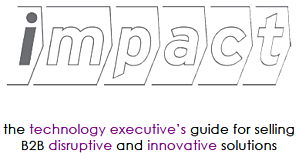 How effective is your existing value-messaging in relating to the problems your ideal customers really care about? How long does it take for salespeople to develop a point-of-view that resonates with buyers? We all want salespeople having conversations and telling stories, - do you arm them with an inventory of conversation points and stories? Are those stories mapped to buyer problems, roles, buying stage, competitive context, so they don’t have to figure them out? Are they ready to be delivered and in a form that is immediately useful? How well do your salespeople create solicitation and follow-up emails, - how long does it take them? How many times do your salespeople tell buyers, “I’m going to have to get back to you on that”? How much more effective would your salespeople be - and how much faster could they become fully productive, if they had everything they needed, right at their finger-tips? How much faster could they learn, if they had the content they need and an ecosystem where they could share knowledge and learn from others, and all they had to do is use it? What if from day-1 in the company, a new sales hire could tap the experience of the most successful sales reps? Key questions to ask and key objections and counters? The real secret to reducing sales ramp times and unlocking sales performance, lies with sales managers. Sales managers must be fully committed to the onboarding and behavior change program… isn’t effective onboarding a behavior change program? Sales managers must fully understand the messaging and sales enablement frameworks provided and how to use them and then coach salespeople in effective use of the tools provided. Much of the above knowledge exists as tacit knowledge inside the heads of the top-performing sales reps and sales managers. 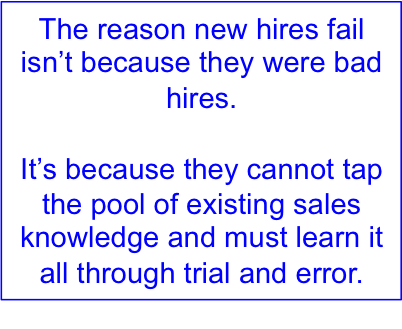 The reason new hires fail, isn’t because they were bad hires, are dumb or lack motivation, most of the time it’s because they cannot tap the pool of existing knowledge and must learn it all for themselves through trial and error. My colleague Jim Burns likes to say, “If it’s not written down, it does not exist”. To move from “random acts of content” to a disciplined approach to capture and maintain content to support acustomer conversations that everyone can use, is a major 5-step undertaking. Top-down commitment from executive management is required to create the sales support infrastructure to reduce sales ramp times. It requires new people (sales enablement and sales operations), executing new processes with the right enabling technology. Customer, content and conversation frameworks are required, along with process to capture and synthesize knowledge in a useful form. A content delivery platform that enables salespeople to quickly locate, personalize and use information is required. Collaborative sharing of knowledge and best practices and a process of tracking and continuously improving content and sales performance. If you would like more information or help with developing customer, content and conversation frameworks or migrating your current marketing and sales enablement content to a more effective content delivery platform, please contact us.